Bush of the family Caprifoliaceae (Viburnum, Kolkwitzia, Honeysuckle, Elder, Weigela). Etymology: named in honor of C.ABEL, English botanist. Origin: Abelia X grandiflora comes from a crossing between Abelia chinensis and Abelia uniflora. Abelia chinensis is native to China. 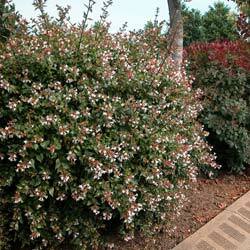 Habitat: Glossy abelia appreciates a sun-exposed site or half-shade. It prefers a light earth to sour tendency. Hardiness: zone 7 (the hybrid grandiflora resists well cold until -17 °C or 1°F ). It fears severe colds, especially in heavy soils. Height: 2 - 2,5 m tall. Leaves: semi-persistent until -10°C or 14°F, obovate, acuminate, green-dark, shining. From 2 to 5 cm long. They are almost sessiles (without petiole). Flowers: white to white-pinkish, of 2 cm long, grouped in terminal panicles. They are slightly fragrant and bloom from July till October. Use: Glossy abelia does wonder in shrubbery, in free hedges or in pruned hedges. Prune (maintenance): A severe pruning is desirable in late winter. - Abelia chinensis : flowers in white-pinkish panicles. - Abelia floribunda, native to Mexico, produces in spring very nice and big crimson tubular flowers. It is not hardy.